Small winery; Big reputation. The Corley Family family is proudly celebrating its fourth decade of excellence in grape growing in the Napa Valley. They take special pride in the stature and recognition as a winegrower and wine producer that we have gained both nationally and internationally as winegrowers since 1970 and wine producers since 1980. 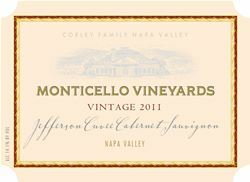 The Corley Family, who founded Monticello Vineyards in Napa Valley, CA in 1969 is widely known for its MONTICELLO VINEYARDS designated wines and highly acclaimed CORLEY wines. The Corley Family grows Cabernet Sauvignon, Cabernet Franc, Merlot, Chardonnay and Pinot Noir on five small vineyard sites in the Oak Knoll, Yountville, Rutherford and St Helena appellations of Napa Valley. These estate grown grapes are used to produce approximately 15,000 cases of wine, exclusively from the Napa Valley. Their over-riding philosophy is that great wines are made in the vineyards. This is why they have made such a tremendous commitment to ownership of the most suitable land within Napa Valley for our grapes. Three sons are intimately involved in the winery: Kevin is the Winegrower and President; Chris is the Winemaker; and Stephen is the Wine Seller. Father and Founder. Tasting Room open daily 10-4:30; shaded picnic grove by appointment. To join the wine club, visit www.CorleyFamilyNapaValley.com or call 707-253-2802. Features a selection of hand crafted Monticello Vineyards and CORLEY wines selected by the family for your enjoyment. Members will receive four bottles of new release wines every other month. Features a selection of hand crafted Monticello Vineyards and CORLEY wines selected by the family for your enjoyment. Members will receive four bottles of new release red wines every other month. For those who love the benefits of membership and the ability to select their own wines, we offer the Independence club. Below you can select your wines for the next two club shipments. A minimum of four bottles is required per shipment. Prior to shipments you will receive and email asking you to update your selections as we may have made additonal wines available. Monticello Vineyards is certified under the Napa Green Winery Program by the Napa County Department of Environmental Management (DEM) and the Association of Bay Area Government’s (ABAG) Green Business Program and completed all the regulatory components needed for environmental sustainability. These components included developing water and energy conservation methods, preventing pollution, and reducing solid waste. In addition to developing sustainable winery practices, this program is set to become the standard for the state of California. Monticello Vineyards is certified under the Napa Green Certified Land Program. Monticello Vineyards has created and implemented a customized farm plan with measured results that addressed all aspects of its property, vineyard land as well as non-farmed land, including practicing soil conservation, water conservation, stable drainage, riparian corridor enhancement, fisheries and wildlife habitat enhancement and long-term improvement and sustainability.